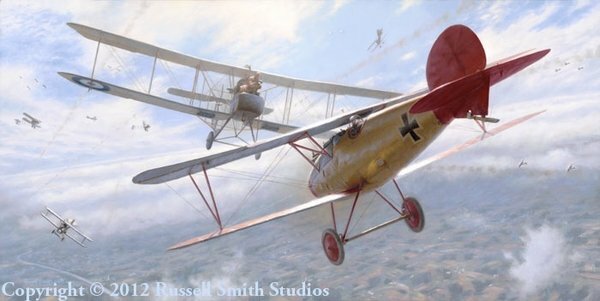 The Eagle and The Butterfly depicts the wounding of Manfred Von Richtofen on July 6, 1917. During the attack on a flight of FE-2d's from 20th Squadron RFC, Richtofen singled out the machine - A6 512 flown by Captain Douglas Cunell and Lt. Albert Woodbridge - and began to press his attack. Cunell spotted Richtofen and threw his lumbering FE-2 to face Richtofen head on.